A couple of weeks ago, E lost her first tooth. It caught me completely by surprise and she ended up swallowing it (along with her second loose tooth last weekend, despite the fact that I kept checking that one! Oh well). 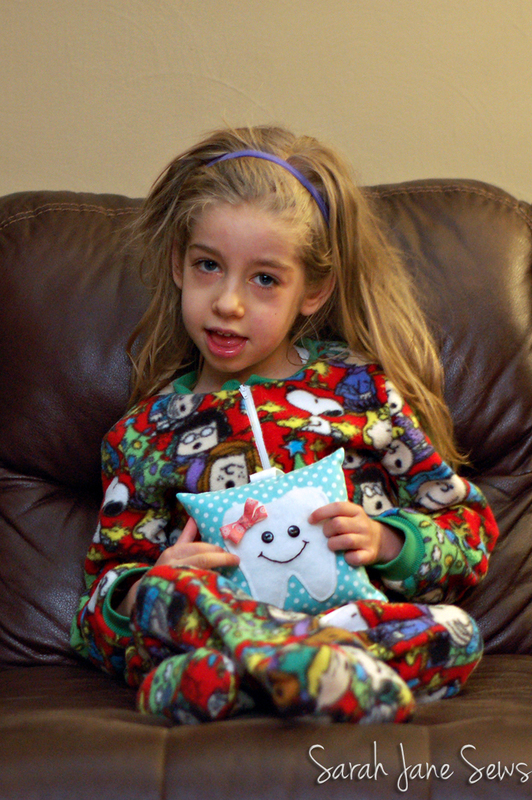 Sometimes I forget that even though her development is nothing like a typical six-year-old, things like losing teeth are still going to happen at the normal times. 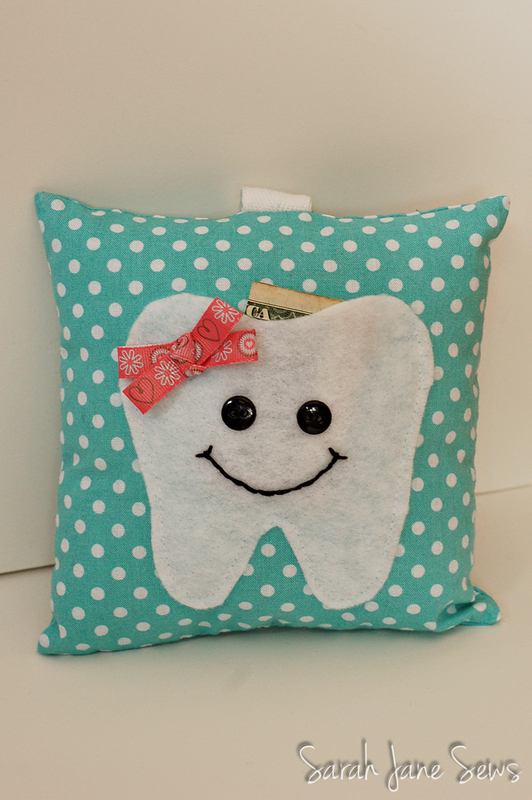 As soon as I saw that little gap, though, I decided to sew up a tooth fairy pillow for her. O has one, but I wanted her to have her own also. 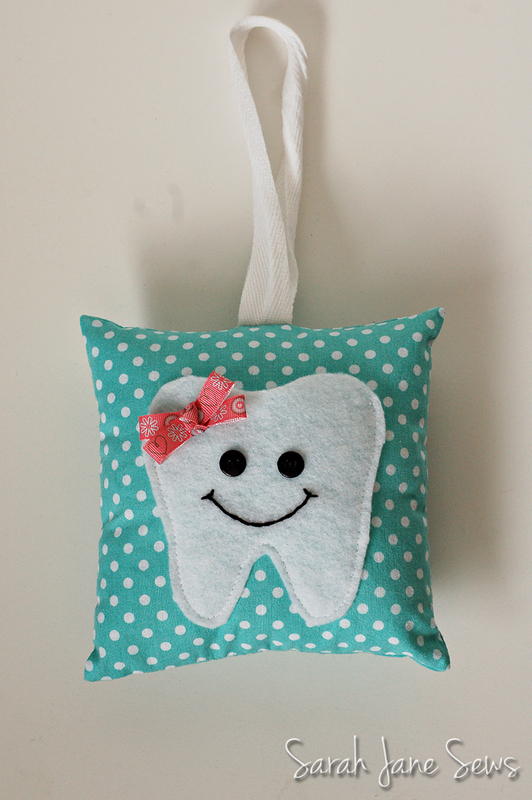 I based it on these super cute ones on Etsy. It was a quick little project. 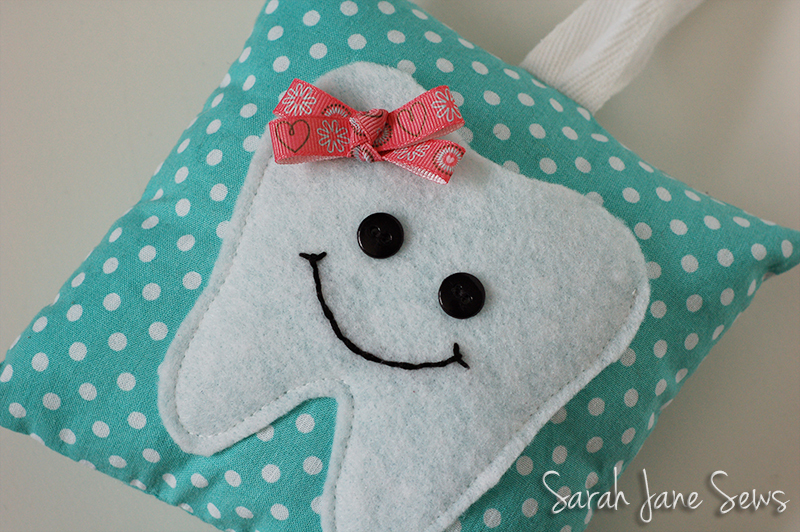 Sewing on the buttons and embroidering the smile took the longest, and even that was fast. In reverse chronological order, here's E's birthday sweater. Since her birthday's today -- Valentine's Day -- it seems appropriate to start with her. 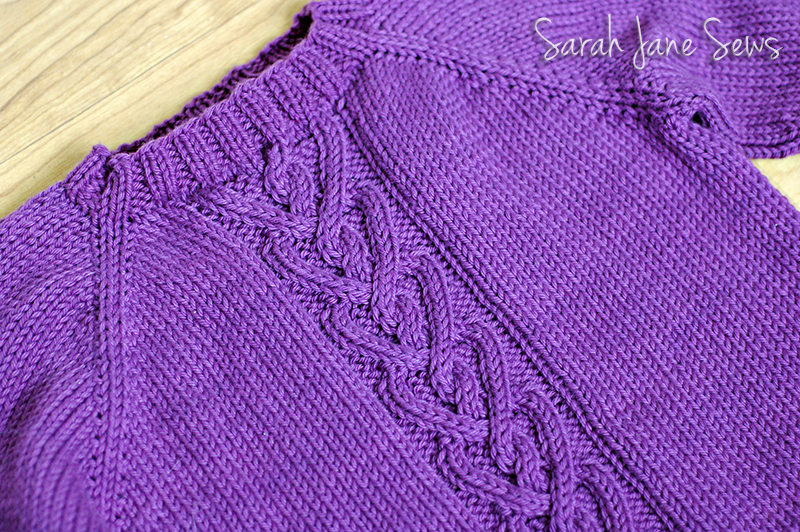 This was a top-down seamless raglan that I changed from a different cable to use this cute heart cable, making it sort of Valentine-y without going over the top. I started it on Saturday and finished it in time for her to wear it to school yesterday, since she doesn't go on Fridays. I would not recommend this short of a time frame. I think my hands are still recovering. It's a little roomier than I necessarily wanted, but I don't think she looks like she's swimming in it, and it'll give her some growing room. She's been showing a preference for purple lately and was all smiles when I showed it to her and put it on, so I think she approves! For my sister, I made another pair of boot toppers. I used the same pattern as last time, but made a few changes. Ray had requested some slippers for around the house, which I was pretty excited about. He rarely asks me to make him anything. 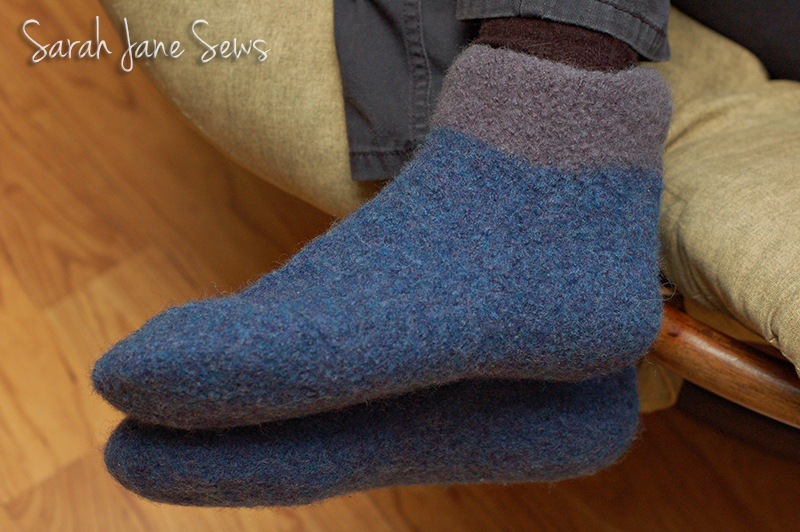 I decided to make felted slippers, which is always fun, and also less likely to be traumatic if they accidentally get mixed in with the laundry. They looked impossibly huge before I threw them in the washer! They felted to the perfect size, though, which always seems rather miraculous to me. I ended up not doing a whole lot of Christmas sewing this year (I had big plans, but didn't get to most of them), but there was a fair amount of knitting. 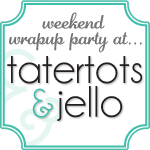 I just mailed out the last thing this week *sigh*, so I'm finally blogging about the gifts as well. I made O's teacher some boot toppers and also gave her some coffee and coconut oil exfoliating scrub that apparently never got photographed. It was brown and in cute jar, so just imagine that. I was quite pleased with the boot toppers. 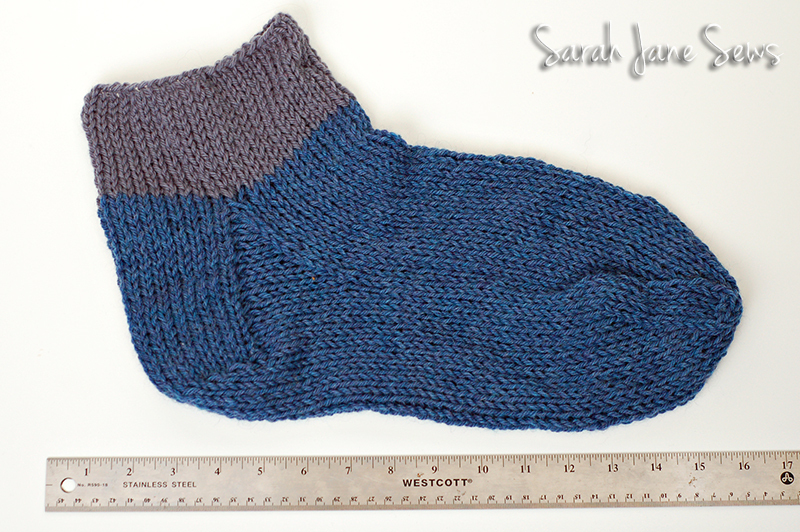 (Ravelry notes) Someday I'd like to make myself a pair. 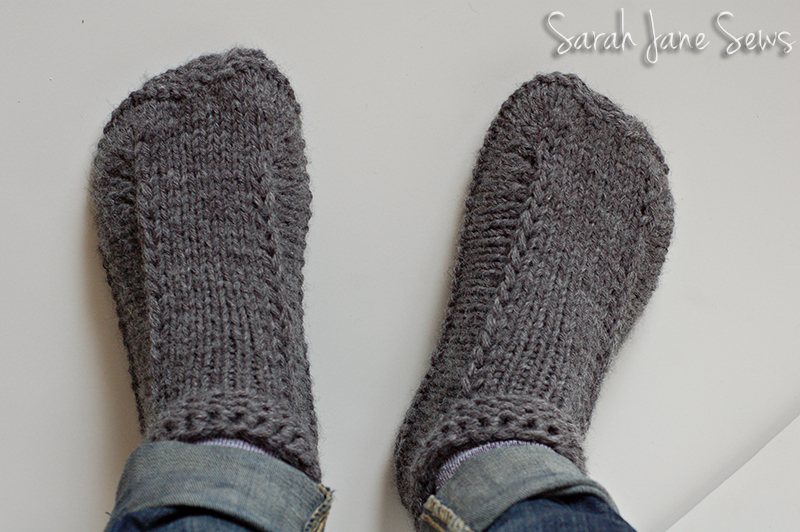 I looked on Ravelry a couple of days ago, and the last time I knitted myself anything was 2009! I still wear that hat too. E's teacher and para also got the scrub, along with some slippers. I made her teacher Bea's Slippers (Ravelry notes) and loooooved how they turned out. 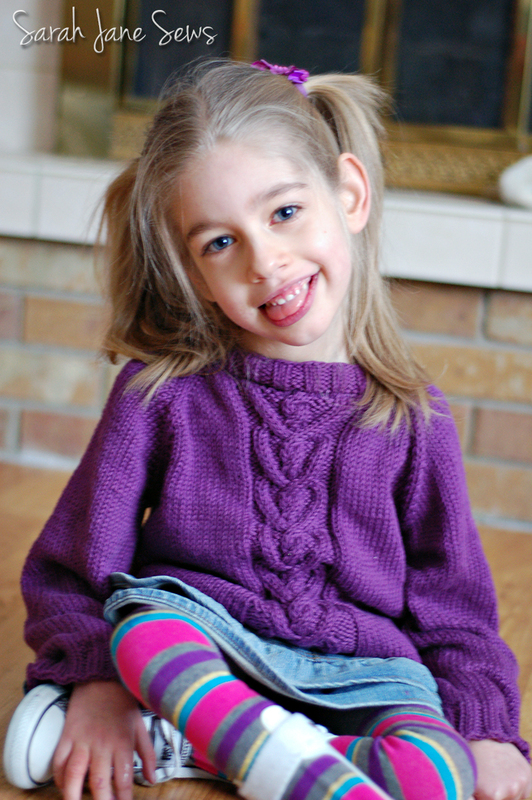 They took a lot longer to knit than I was expecting, though, so I had to find a quicker option for her para. 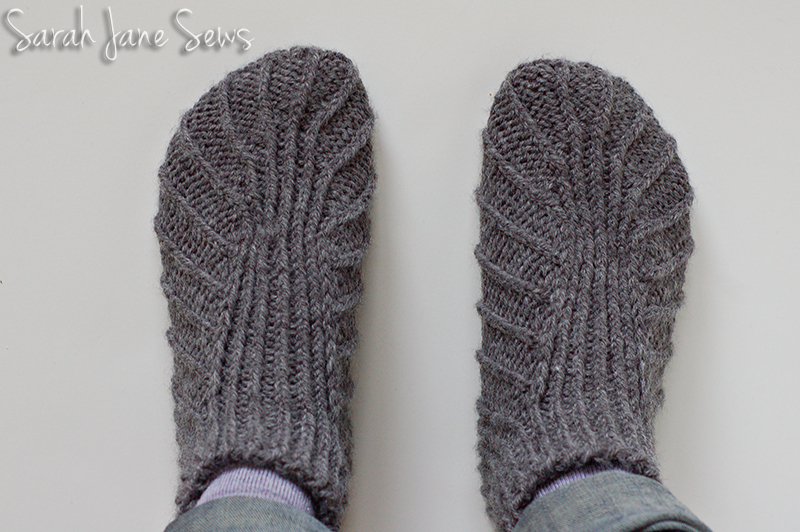 I ended up knitting double-stranded slippers for hers, and they were super quick and quite squishy. 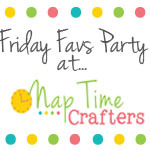 (Ravelry notes) She told me after the break that her kids kept swiping them from her. Haha. I also wanted to give a little some thing to the secretary at E's school, since I end up bugging her to sign in and out nearly every day at drop-off and pick-up time. 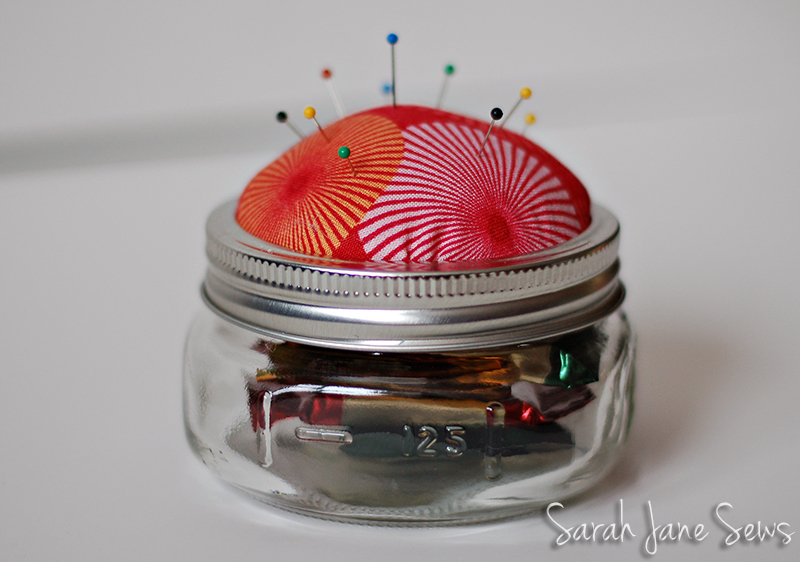 She had a bio up in the entrance at the beginning of the year that said she sewed, so I had that in the back of my head and decided to make her a jar pincushion and fill it with a few chocolates. Honestly, she had one of the best reactions to a gift that I've given in a long time. It made my day to see how happy she was that I had read her bio and remembered that she sews. Here's my only actual sewn project! Ray asked for a phone cozy for when he runs in the cold. 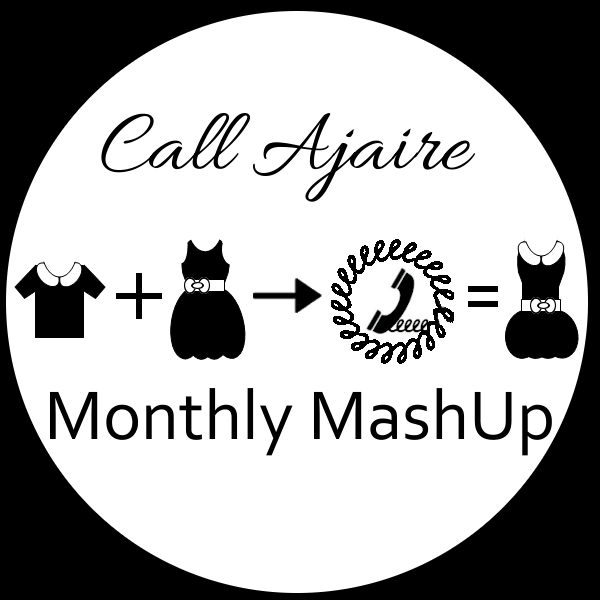 I took this tutorial and simplified it, since I knew he couldn't care less about the piecing. 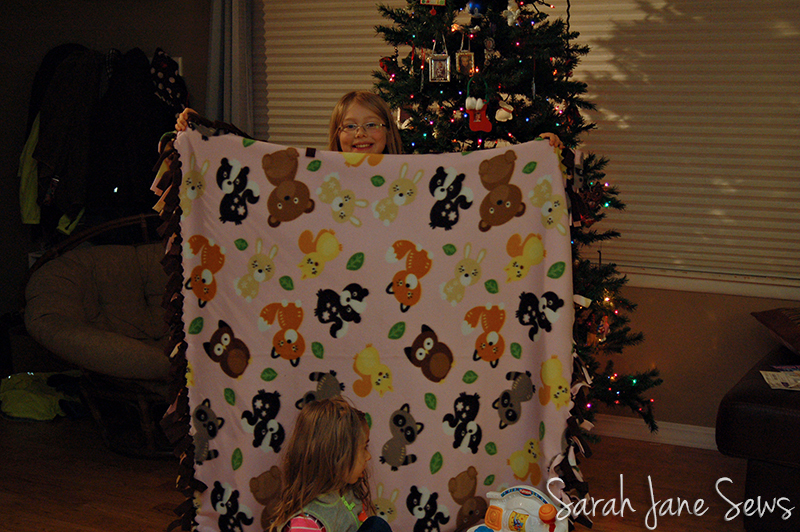 O wanted to make E a blanket and decided a tie blanket would be the way to go. He was right, she loves the fringe. He chose the fabric, I did the cutting and Ray and I both helped him tie it, but he did a significant part of it. It looks like E's staring down that raccoon. 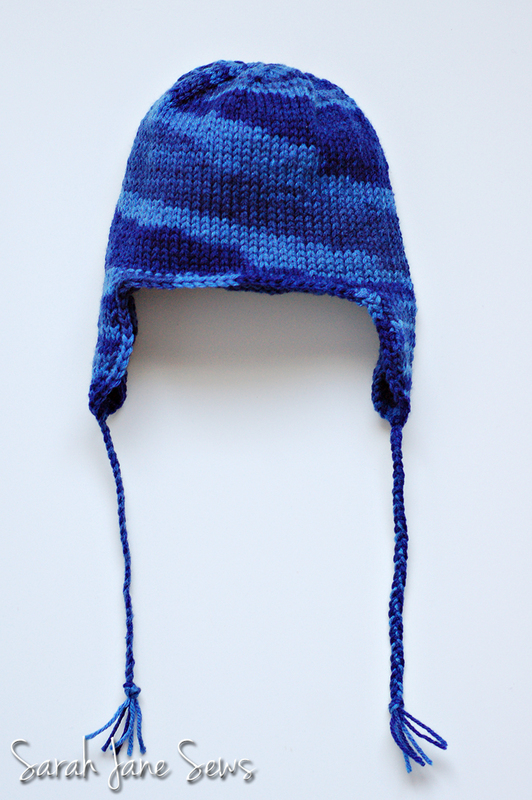 Back to knitting (I have no rhyme or reason to this post, I guess), my SIL requested an earflap hat for her younger son, so I made him this one. 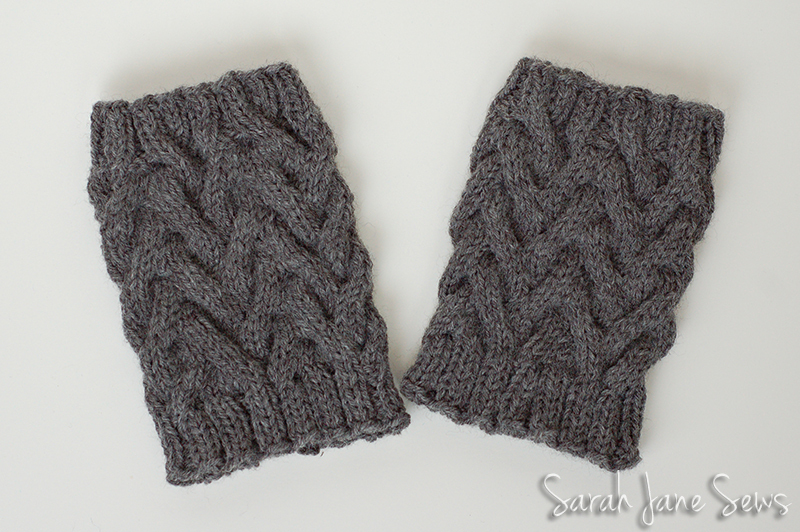 (Ravelry notes) This was my most shamefully late gift of this holiday season. Winter doesn't seem to be ending anytime soon, though, so he will have plenty of opportunity to wear it still. Hopefully it fits! And last, but not least, the kids' annual Christmas ornaments. (You can see 2011's here and 2012's here.) 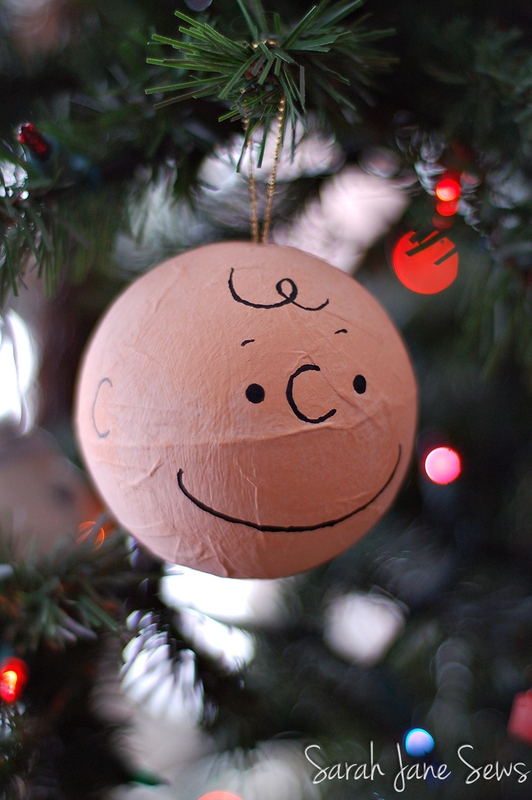 O has been very into watching the Peanuts holiday specials, so I was inspired by this ornament on Etsy and made him Charlie Brown. I wanted to use a glass ball like the original, but couldn't find any when I finally went shopping (I think Hobby Lobby has them, but it was a Sunday, so they were closed). I settled for a paper mache one instead, so Charlie Brown is a little bumpier than I would have liked, but O didn't seem to care. 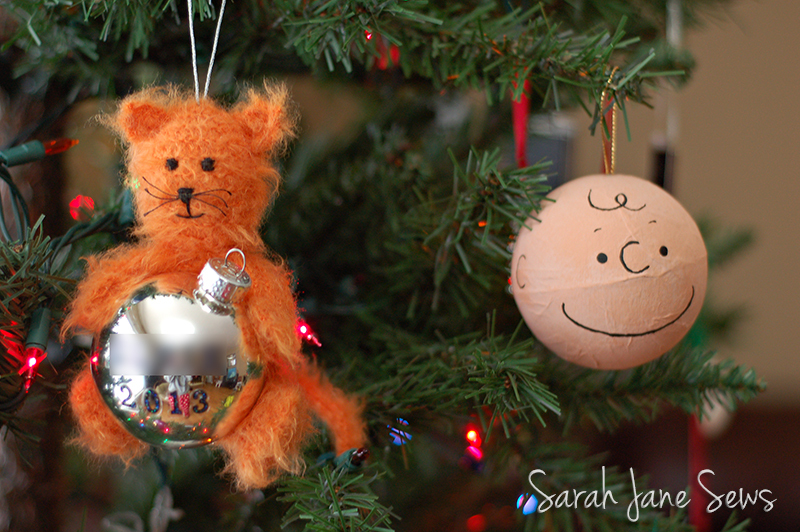 E's ornament was again based on her Halloween costume (as well as her on-going love of our cat). 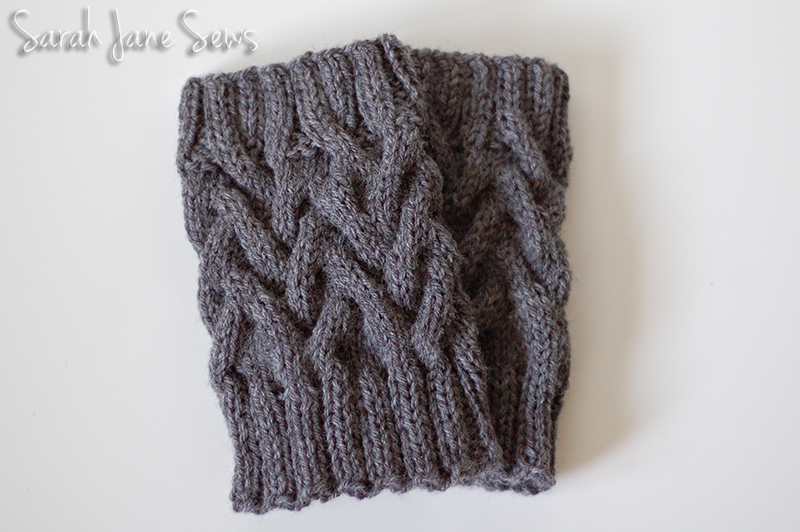 It ended up being a huge pain to knit and then sew up this fun fur yarn, but I do like how it turned out. 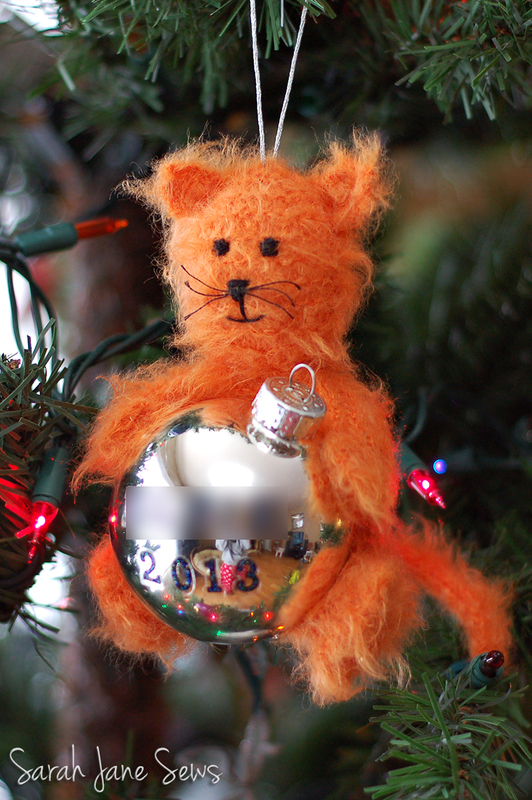 (Ravelry notes) I used scrapbooking stickers to put her name (blurred out, obviously) and the year on the ornament the cat is holding. Stickers are the way to go. Much less stressful than trying to paint the name and year with a shaky hand like I did on O's! And that's it! I felt really busy, but I guess I didn't really accomplish much. Now I'm on to working on birthday gifts, since we have several in our family in February. 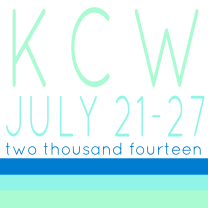 Winter KCW was this week, but I didn't even make an attempt this round. I have been enjoying looking at what other people have been making, though! 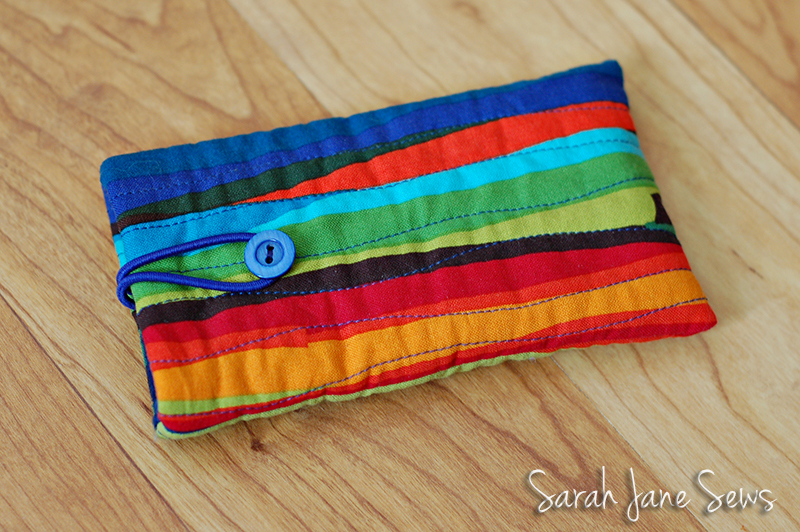 Have you been sewing along?